Snow coats the ground of Flagstaff Mountain on a cold March Morning. Part of Boulder, Colorado Open Space and Mountain Parks, Flagstaff Mountain typically gives unhindered views east towards Colorado's high plains. 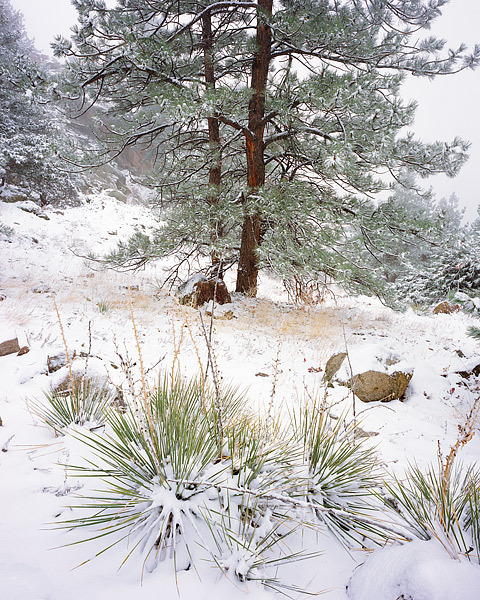 In this photo Yucca's and a Ponderosa Pine are coated with a light dusting of snow as fog sifts in and out of the trees. Photo © copyright by Thomas Mangan.